Photo Credit: Willam Barba – UtahOutdoorSports.com The Denver and Rio Grande Western Rail Trail extends from Farmington Bay Bird Refuge, where it joins the Legacy Parkway Trail, and runs north through Layton to 4800 S St. near West Park in Clinton. Beyond that the trail continues to Hinckley Drive in Roy. The trail continues to Clearfield and terminates in Roy. The abandoned right-of-way is owned by the Utah Transit Authority in a land bank for future transportation needs. The various cities it links with have agreements with the light- and commuter-rail agency to maintain the trail. 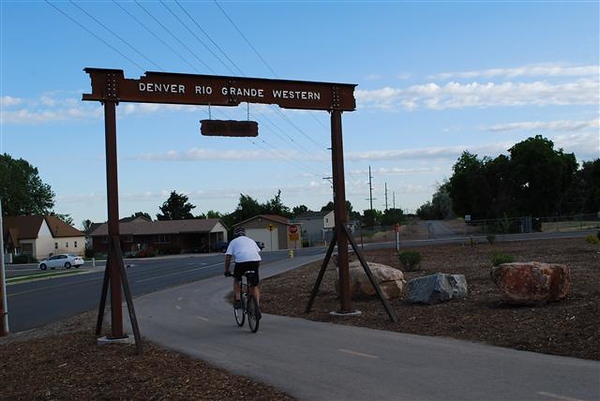 Since 2006, four separate Transportation Enhancement awards focused on building the Denver and Rio Grande Western Rail Trail. In total, $1.28 million was invested through TE with an additional $320,000 coming from local sources for a total of approximately $1.6 million. The trail is 23.7 miles long and offers connections to the Legacy Trail and the Jordan Parkway Trail.